With the range of temperatures in 2017 thus far, Chicago has had several spring-like days and citizens are returning to one of their favorite warm-weather past times: biking. While many Chicago citizens have their own two-wheeled transport, both locals and visitors alike take advantage of Divvy, Chicago’s bike share system. Since it’s establishment in 2013, Divvy has grown in size and service, making it the third largest bike share program in North America (behind Washington D.C. and New York City). Divvy is owned by the Chicago Department of Transportation (CDOT) and operated by Motivate, which owes the majority of U.S. bike share programs. Currently, Divvy has over 580 stations docking around 5,800 bikes throughout Chicago and the nearby suburbs of Oak Park and Evanston. Bike share programs are designed for short-range or one-way trips lasting no more than 30 minutes, making it great for commuters or visitors on the Lake Shore Trail. To begin riding, riders must first purchase a 24-hour pass (9.95 plus tax) or a Divvy membership (varies). Then undock the bike, ride, and re-dock it at any Divvy bike dock in the service area. While passes last 24 hours, bikes must be docked every half hour to prevent additional fees. 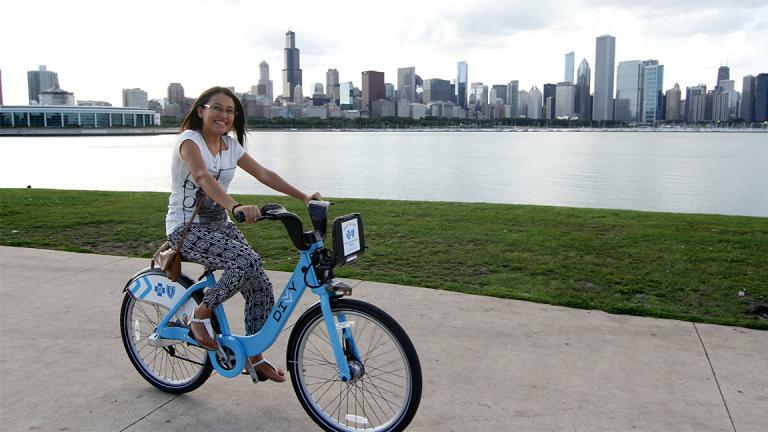 One of the primary goals for Divvy and other bike share programs is to connect to other transportation methods, such as connecting to a CTA bus line or a Metra train line. Since its establishment, Divvy has been widely popular in Chicago. In a statement by the Mayor’s office at the end of 2016, Divvy was near (and since surpassed) 10 million trips in less than four years of operation. With the additions of Evanston and Oak Park, Divvy covers the largest geographic area of North American bike share programs. Lake Shore Dr. & Monroe St.
Lake Shore Dr. & North Blvd. Michigan Ave. & Oak St.
Clinton St. & Madison St.
Canal St. & Madison St.
As Divvy grows in usage and popularity, they have introduced a number of discount memberships to ensure more people are able to use the bikes. Many Chicago corporations have a Divvy partnership and students are eligible for a discounted annual membership fee. Most recently, Divvy established the Divvy for Everyone program in 2015, a discounted annual membership for qualifying customers based on their household size and income. This is a one to two year discount membership starting at $5. This also allows for memberships to paid for by cash, eliminating the requirement of a bank or credit card that is needed for 24-hour passes and most annual memberships. More information on this program can be found below. As the weather gets warmer, consider trying out this bike share program for a fun new way of seeing the city. 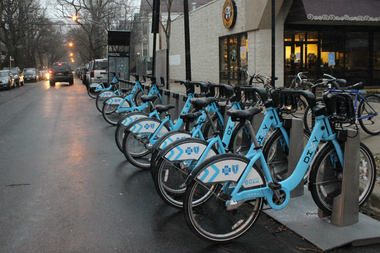 See all the current Divvy stations here. Last week, the Chicago Cubs made history by winning their first World Series in over 100 years. The famous “Billy Goat Curse” was broken and Cubs fans around the country rejoiced. This victory will go down in history and be as essential to Chicago as the Cub’s stadium itself: Wrigley Field. It’s located between Lakeview and Uptown in the appropriately named Wrigleyville and is one of the oldest stadiums in the Major League. Since it’s construction, Wrigley Field has undergone big changes, massively impacting the surrounding neighborhood and becoming a famous Chicago icon. Wrigley Field was built in 1914, making it the second-oldest ballpark in the country. Initially called Weeghman Park (after property owner Charles J. Weeghman), the park was built on the grounds of an old seminary at Clark and Addison on the city’s north side. The initial stadium allowed for up to 14,000 visitors. The first game at Weeghman Park was on April 23, 1914 where the home team, the Chicago Federals, played Kansas City. Weeghman purchased the Cincinnati Cubs in 1915, moving the team to its now permanent home. The Wrigley family purchased the Cubs franchise in 1920 and the stadium was renamed in 1926 after Cub’s owner William Wrigley Jr.
Once called Central Lakeview, the area was renamed Wrigleyville to celebrate the park. Unlike many stadiums, however, Wrigley Field is in the middle of a dense residential and commercial neighborhood: therefore, all stadium renovations and changes directly impact the residents of Wrigleyville and interests can often clashes with the team’s ownership. One key example is the long-awaited approval for stadium lights at Wrigley to allow night games. Unlike the White Sox’s Comiskey Park (now known as Guaranteed Rates Field) who gained lights in 1939, Wrigley could only have day games for its first 74 years. Lights were only installed in 1988 after the Cubs threatened to leave Wrigley if the renovation was denied. There are also no official parking lots for the field, making street congestion a constant throughout baseball season. Under its most recent ownership, however, Wriglyville will look very different in the upcoming years. Since 2015, Ricketts and his associated businesses purchased 10 of 16 rooftops surrounding the park, where fans have full view of the game from the top of nearby buildings. Huge signs from companies such as Budweiser now stand on the outer perminter of the stadium, bringing large revenues to the team while blocking the view of rooftops that refused to sell. A McDonalds adjacent to the stadium on Clark Street was recently demolished after being purchased for $20 million: now, a hotel is being constructed on the site. Plazas were created on all sides the stadium and will host events both on and off game days. Northwest of the field, a large building for Cubs’ offices and related retail shops will overlook the stadium. Mark Schlenker, a local rooftop owner, noted that the Cubs ownership made it clear they want to purchase all of the buildings on the east-bordering street of Sheffield Avenue. While Alderman Tom Tunney is optimistic about the economic growth of these plans for Wrigley, there are concerns about how this will affect long-time residents and businesses in the neighborhood. With an average of 40,000 fans in attendance at Cubs games, however, there is a strong draw to diversify and expand businesses in the area. The team will work closely with both Alderman Tunney and Mayor Emanuel as field renovations continue into the upcoming years. 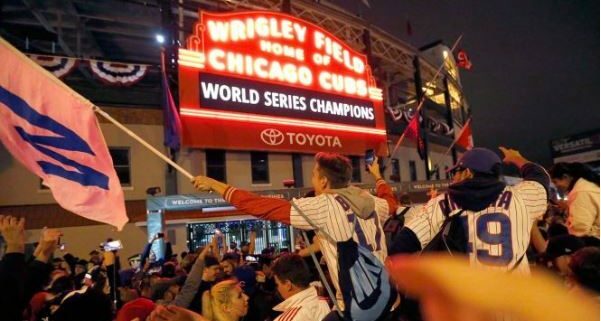 As the 2016 World Series Champions celebrate their victory, it is clear that Wrigley Field (and all of the changes to come) will remain an important part of the Chicago landscape for years to come. When is Easter Celebrated…And Where? For Catholics and Protestants, Easter already happened this past Sunday. However, for Orthodox-Christians it is still to come. Why, you might ask? The reason has to do with the different calendars that Orthodox and non-Orthodox churches follow. I learned from Kathleen Manning’s article that Pope Gregory XIII decided to implement a new calendar for areas under Catholic influence in 1582, because the old one – the Julian calendar – was 11 minutes too long. To fix this issue of time, Gregory zapped 13 days from the old Julian year which moved the official day of spring – the Spring Equinox – from April 3 to March 21. Now, you may or may not know (I didn’t until earlier today) that Easter always falls on the Sunday following the first full moon on or after the Spring Equinox. Since Orthodox churches follow April 3 as the Equinox, the timing of the full moon can make Easter land on a different day. Last year, for example, there was a full moon on April 15 – after the Equinox date on both calendars – so Easter was celebrated on the same day. This year, because of the timing of the full moon, Easters are separated by a week (the Orthodox one being on April 12)-meaning bonus celebrations for any families that might have a mixture of Orthodox and non Orthodox backgrounds! In Chicago, there are thousands of immigrants from countries with predominantly Christian Orthodox backgrounds. 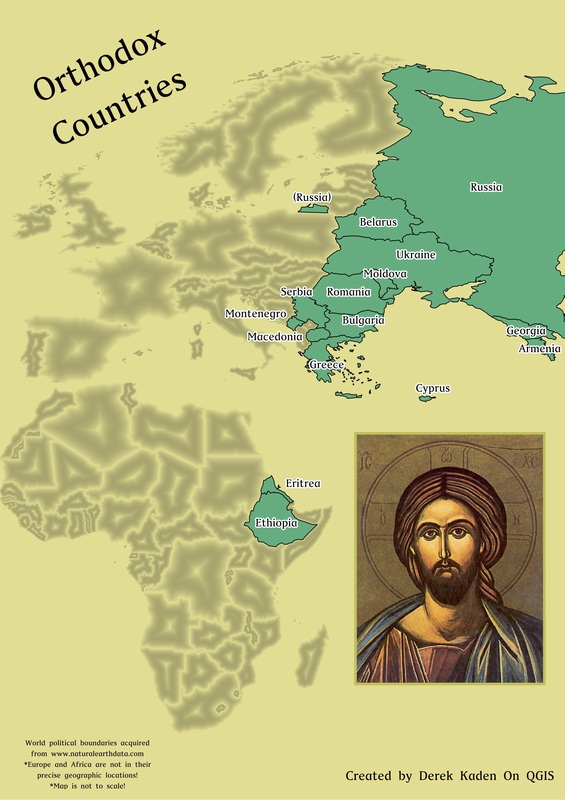 Check out the Christian Orthodox Countries map below, and whether you’ve celebrated it already or not, happy Easter! http://www.geographicsociety.org/wp-content/uploads/2014/08/logo-300x98.png 0 0 The Geographic Society of Chicago http://www.geographicsociety.org/wp-content/uploads/2014/08/logo-300x98.png The Geographic Society of Chicago2015-04-10 14:36:502015-06-05 16:06:56When is Easter Celebrated...And Where?